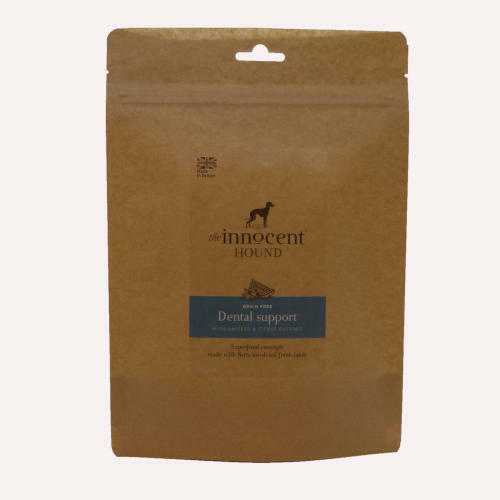 The Innocent Hound Functional Treats are the newest addition to The Innocent Hound range. Featuring 3 scrumptious flavours, each of which catering to different dogs' needs, these treats are bound to go down well with your pooch! These luxury sausages are made with 80% fresh British lamb and contain breath-freshening aniseed, together with citrus extract - a powerful antibacterial and antifungal remedy that helps prevent the build-up of plaque and tartar. Composition: 80% British lamb, vegetable glycerol, aniseed (5%), potato, citrus extract (0.2%). Composition: 80% British chicken, sweet potato, potato, glycerol (derived from rapeseed oil), turmeric (5%), black pepper (0.2%). Composition: 70% British fish, vegetable glycerol, potato, aloe vera (5%), spirulina (0.02%).